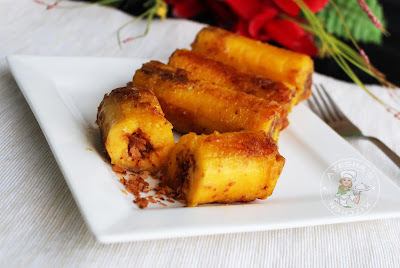 This is the healthy version of stuffed plantain recipes.Most of the healthy sweet snacks in India, especially in Kerala are made with egg, plantain, and coconut. Here am with yet another Malabar delicacy with ripe plantain. A healthy snack idea. Normally stuffed banana/plantains are deep fried after the stuffing and coating in flour mixture. Here i cut the whole plantain into halves and then stuffed the sweet filling without making any slits. Then toast/roast them in a little oil over a low flame. You can also bake the same instead of toasting for baked plantains. This makes this yummy snack more attractive than stuffing a whole plantain (stuffed whole plantain recipe). Stuffed plantain / ethakka / pazham nirachath is an authentic malabar delicious snack which is very commonly prepared during special occasions. I love simple ripe plantain recipes like kaay pola, banana fritters, roasted plantains/banana toast, banana cutlets, fried banana recipe / fried plantains etc.. but my all time favorite is Unnakaaya / stuffed mashed banana fry. Here, for stuffed banana, the main ingredient is ripe plantain (not too ripe) and is stuffed with sweetened cardamom flavored coconut and nuts. The fillings depend upon your taste only. You can stuff with your favorite sweet fillings like sweet coconut filling, coconut nuts filling, coconut and rice flakes filling and even can fill it with egg and sugar filling. 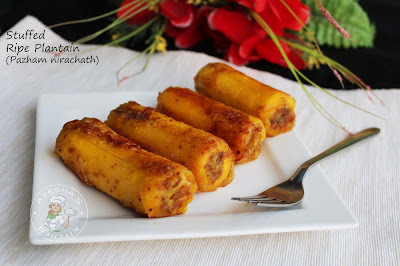 Here is the recipe showing how to make ethakka nirachath / stuffed plantain/plantain breakfast recipe /how to fry plantains/plantain banana recipes / easy sweet snack recipes. Do try and do not forget to drop your valuable feedback. Enjoy. This flour mixture is required only when the sides of plantain gets open while stuffing. For a healthier version, you can skip this mixture and instead, you can toast both the ends carefully in ghee. Dry roast the grated coconut, sugar, cardamom powder and chopped almonds over a low flame until it becomes slightly golden and crispy. Saute them continuously until done. For those who like soft coconut stuffing, can stop roasting the coconut mixture once a fine aroma comes. When done, transfer it to a plate and set aside. Peel and cut the two ends of the ripe plantains (ethakka). Now cut them into halves. This makes it more attractive than the Whole stuffed plantain. Carefully scoop out the inside black seed using a scooper or apple corer or even with a knife. Do check the picture given above. Now stuff carefully the plantains with the coconut mixture. Make a batter with all purpose flour, sugar, turmeric powder and a little water. The batter must be thick and flowing consistency. 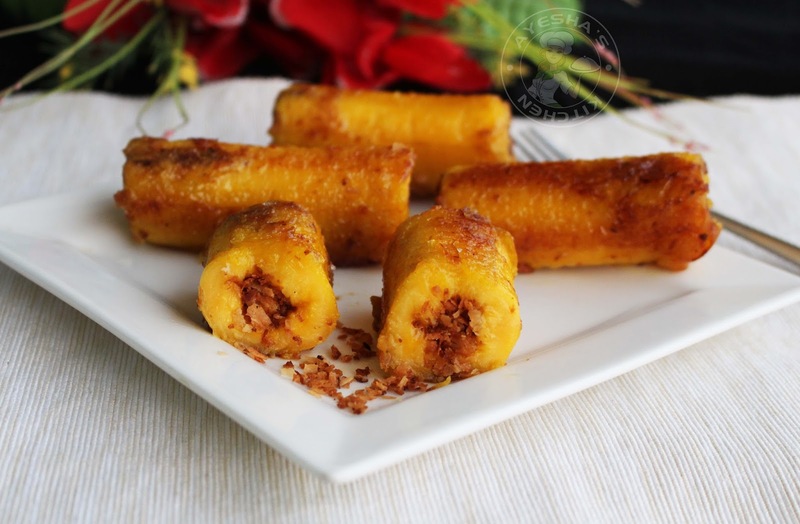 If you need a fried stuffed plantain, you can dip the same in the flour mixture and deep fry. But here is a healthy version. Just seal the ends with the flour mixture and then toast it in little oil/ghee like we toasting banana (pazham vaattiyath). Heat ghee in a nonstick pan. Seal the ends with the batter and then toast the stuffed plantain over a medium low flame until done. You must toast it in a medium flame until all sides are done. You can add a tablespoon of sugar while toasting for a caramelized texture. When done, serve hot. Enjoy your evening with this healthy recipe.